The Monroe Center Fire Protection District is about as rural as it gets, but its volunteer force is forward-thinking in every way. “The high-speed broadband capabilities made possible by iFiber will mean we can do crucial training in-house via video-conferencing,” said Capt. Rich Wilson, the department’s training officer. “We will reduce department costs by keeping our fire fighters here. It’s about dollars and cents. 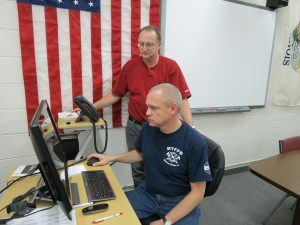 We will reduce travel expenses, risks and time lost, in addition to being able to expand the number of classes and training sessions we can hold at our department,” added Jim Meyers, fire department trustee who has 30-plus years as an IT professional. As part of a recent FEMA grant, the MCFPD was able to purchase a “Smart Board” – which enhances distance learning and video-conferencing. “Thanks to the iFiber Network, we are able to host training sessions here for our region, including all of the departments in Ogle County; and possibly collaboration with DeKalb and Winnebago County departments,” said Wilson. Meyers encourages all fire departments to investigate FEMA grants for upgrading their technology. High-speed broadband like that supplied through the iFiber network allows faster download times of training materials all fire fighters need to maintain certification for the State. “This allows us to have remote access to highly-qualified instruct-tors throughout the nation, and also makes it more attractive for volunteers to join the department. Time is a huge factor—with family and work commitments,” said Meyers. Another application is remote EMT training through the local hospital network.